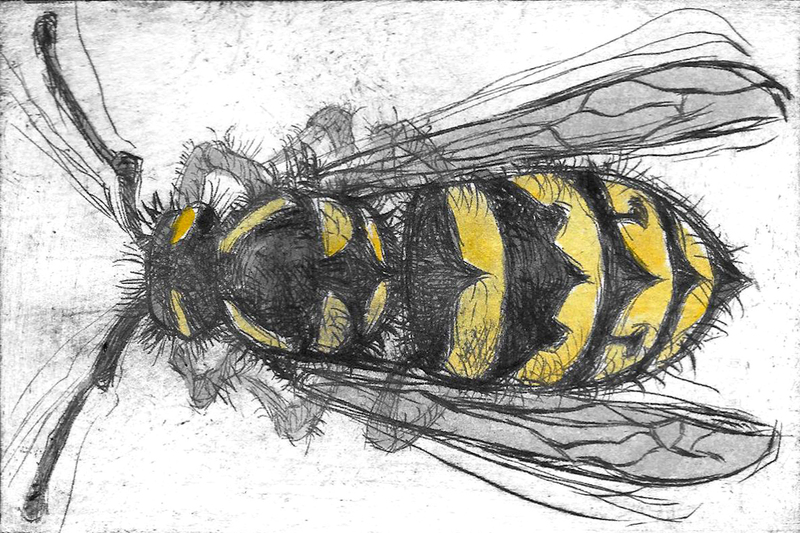 In this workshop you will experiment with composing imagery using the intaglio printing technique known as drypoint, as well as collaging colour and texture from newspapers into drypoints and onto plates and running them through the press to create integrated seamless images. You should arrive with various line drawings in your sketchbooks; these can include hatching and cross hatching to produce areas of tone. (If you don’t have a collection of drawings to choose from, we will have some images on hand.) You will be able to lay a 4 x 6 inch plexiglass plate onto your drawings, and pick one (or two if you also use the back) of your drawings to arrange within the 4 x 6 inch plexi plate and scribe the drawing onto the plate with a sharpened nail/scribe. Unlike relief printing, which prints the raised part of a plate, intaglio plates are inked deep into the inscribed lines and most of the ink is wiped off the plate with the exception of the tenacious ink deep within the lines. The plate is then run through the press and a line drawing with a unique aesthetic is produced. Over the course of the workshop you should be able to produce a small edition (of 3 to 5 images) or two, either consistent or variable, of drypoint prints, as well as several chine colle collages, including drypoints embellished with chine colle. All of your successful images will be original printed art suitable for framing. As well as learning a technique for the production of interesting visual art, the workshop should serve to increase your awareness of printmaking as a unique art form in the past, and the present, both locally, nationally and internationally. We have some aprons, but wear clothes that can withstand the elements (i.e. glue, paint, etc.) of a fun, creative art studio. Please bring your sketchbook with various line drawings.